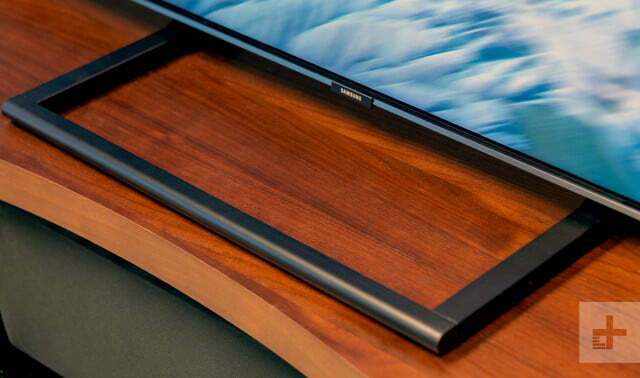 Samsung’s Q9FN is the best LED TV we’ve ever tested. Since I began reviewing TVs 10 years ago, I’ve witnessed the flailing fall of plasma, the rapid rise of OLED, and, in the middle of it all, the plodding progression of LCDs. At least, that’s how it felt. The improvements to the aging TV tech have been mostly incremental, so despite real innovation in those 10 years (LEDs, quantum dots, 4K resolution, HDR) they arrived slowly enough that it never felt like a revolution. Even the first Samsung QLEDs felt more like an evolution than revolution. Samsung’s 2018 Q9FN QLED TV is the epiphany we’ve been waiting for. Simply put, it’s the best TV Samsung has ever made, and the most well-rounded LCD I’ve tested. Most shockingly, it’s not even just about the killer picture. Most folks set their TV up themselves, so it’s in TV makers’ best interests to make that process as simple and gratifying as possible. One hiccup too many, and that TV is going right back in the box and shipped off to the retailer from which it came came. As the number one TV brand in the U.S., Samsung is acutely aware of this, and has refined the setup experience for its TVs to a fine art. Roku TVs come close in terms of simplicity, but in the end Samsung QLED TVs offer the most pleasurable setup experience available today. It starts with simple stand assembly — if you’re going that route — or the ability to flush-mount the TV to the wall using Samsung’s no-gap wall mount. A more traditional mount is always an option, but for the cleanest look, we’d recommend Samsung’s custom mount since the TV is a little on the thick side (more on that later). 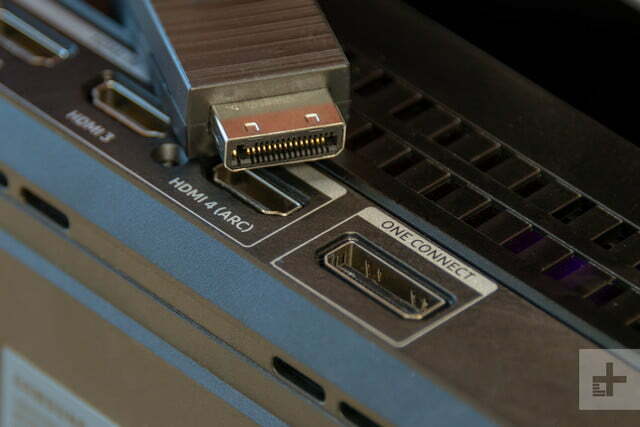 The next point of setup involves connecting your components, which will be made to Samsung’s One Connect box. 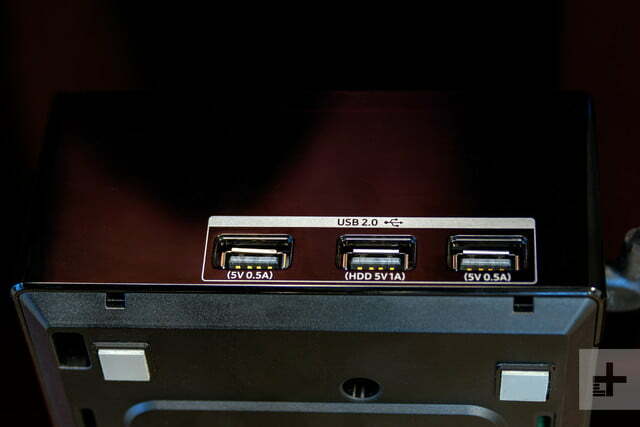 The size of a VCR with the back half chopped off, this box connects the TV’s brains, HDMI ports, and this year, even the power supply. 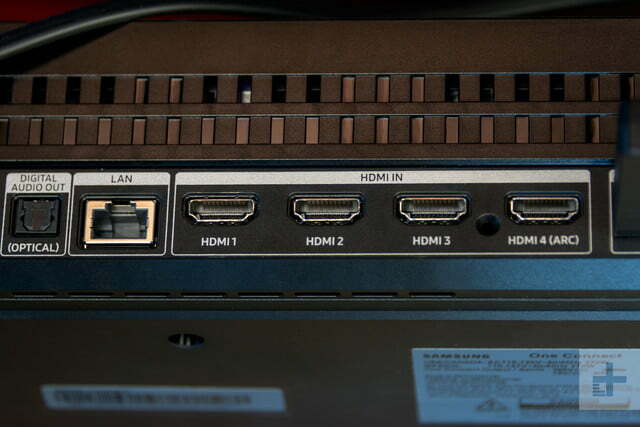 This means that the One Connect box is a bit bulkier, but it also means one tiny fiber-optic cable runs to the TV and that’s it. It’s so small it can run up the wall undetected, especially if you choose to paint it the same color as your wall. Samsung QLED TVs offer the most pleasurable setup experience available today. Once erected and connected, the Q9FN all but completes the setup process itself. 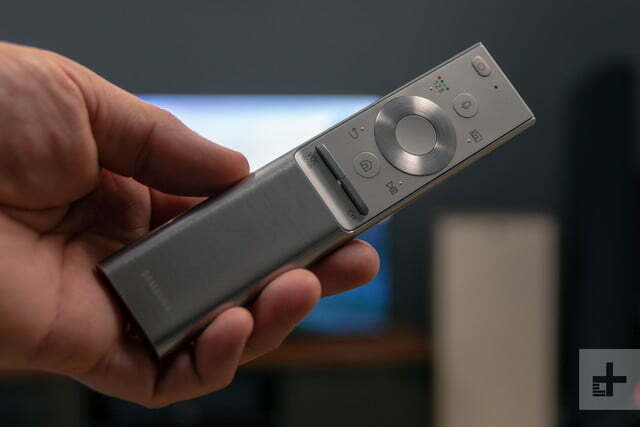 The TV will automatically find any phone using the Android or iOS version of Samsung’s SmartThings app and offer to use that phone’s settings to automatically share Wi-Fi credentials, instantly connecting the TV to the internet. 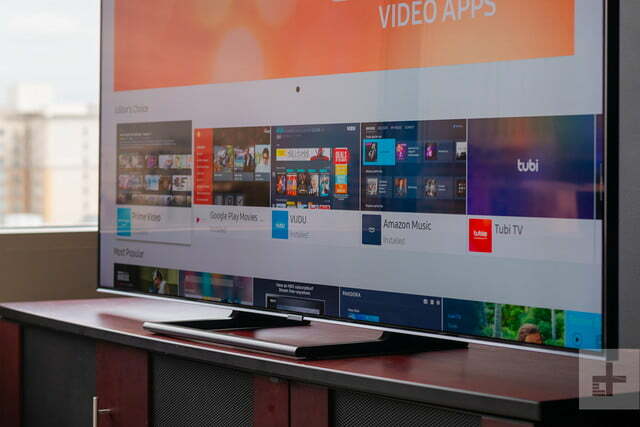 Soon, pursuant to a firmware update, the TV will also be able to get login information from an array of streaming TV apps on your phone — like YouTube and Hulu — so that you needn’t subject yourself to the frustrating process of pecking out usernames and passwords for half an hour. With that out of the way, the Q9FN will offer to program the tuner to receive local over-the-air (OTA) broadcasts from TV stations through its tuner, then detect any sources connected via HDMI (game consoles, Blu-ray players, cable/satellite boxes, etc. ), auto label those inputs, and finally program the TV’s simple remote control to operate all of them. No annoying remote codes to hunt down and punch in. From automatic Game Mode, to an all-new Ambient mode, right on down to the sleekest version of the Tizen smart TV interface we’ve seen yet, the Q9FN does just about everything you could possibly want a TV to do, plus a few things you might not have thought possible. Here are the new features added to the Q9FN for 2018. Samsung’s automatic game mode detects when a game title is being loaded by analyzing the content, not the input source, so even if you use your console to stream Netflix as well as play games, the Q9FN will know the difference between Need for Speed and Need for Speed: Payback. Now gamers won’t have to go into the TV’s settings menu and manually switch in and out of game mode to get the low input lag and juiced-up brightness it brings. Confused about 4K Ultra HD TVs? We’ve put together this comprehensive guide to get you up to speed on just exactly what 4K Ultra HD is, and what it means for your next TV purchase. With a new Ambient Mode, users can take a picture of the TV in its environment and it will mimic its surroundings, helping it sort of disappear into the room. Whether it is placed against a brick background (common for folks who mount their TVs over a fireplace) or against a textured wall, the Q9FN’s Ambient Mode attempts to re-create, on-screen, the look of whatever colors or textures are immediately surrounding the borders of the TV – it’s a sort of chameleonic disappearing act. Ambient Mode is a feature that seems neat in theory, and, when it works, is cool to witness, but it seems more like a move to make Samsung’s QLED TVs stand out than something people are dying to use in their homes. We found the TV had some trouble perfectly matching colors, but as long as the camera can see patterns and textures, it does a great job of mimicking those. Samsung’s smart TV experience is better than ever with the latest version of its Tizen OS. Apps like Netflix load incredibly quickly and start playing content almost immediately. Switching between apps is lightning fast, and playback always picks up where it was left off. Most of our favorite apps look as good on Tizen as on any other platform, and the impressive library of apps is growing all the time. Our only complaint here is with Bixby, which doesn’t serve the role as voice assistant as well as Google Assistant or Alexa. When it understands you, search results are very good, but we stumped Bixby on multiple occasions and found ourselves just typing in search terms more often than we’d like. Finding 4K content, for example, was a bit of a chore as Bixby misinterprets “4K” as “for k.” Hopefully, this will improve in time. Increasingly, we use our phones to find content, then simply cast it to whatever TV is handy. The Q9FN was always right there and reacted quickly to our streaming commands. This just added another point a long list of reasons we think this is one of the most well-rounded TVs you can buy today. Beneath the new user-facing features, a couple of tech features profoundly upgrade this TV’s performance. The most notable upgrade is to the TV’s backlight system, which went from an LED edge-light system in 2017 to a full array local dimming (FALD) system in 2018. With nearly 500 zones of local dimming, the Q9FN joins the Sony Z9D as one of the most advanced LED/LCD TVs on the market. The level of control over the lighting is evident, as we’ll describe below, yielding extremely bright images with intense HDR highlights as well as some of the best black levels and overall contrast available in an LED/LCD TV today. The Q9FN also sports a new advanced anti-reflective coating (called Q Contrast Elite), which dramatically improves the TVs performance in both dark and bright rooms. In dark rooms, the halo effect around bright objects on dark backgrounds is far less noticeable than on competing LED/LCD TVs, and in bright rooms the coating helps reject ambient light, mitigating wash-out from ambient light or spot-light effects from lamps and other light fixtures. By reducing light leaks, that coating also improves off-angle picture quality, which is just horrible on most TVs which use a vertical alignment (VA) LCD panel. The Q9FN does just about everything you could possibly want a TV to do. Samsung Q Color is an incremental improvement on its Quantum Dot technology, which helps the TV produce a wider array of colors and increase color volume. On the picture processing front, Samsung includes support for HDR10, Hybrid Log Gamma (HLG) and the emerging HDR10+ standard. In some ways, HDR10+ is like Dolby Vision HDR — it optimizes color and contrast scene by scene, rather than once for an entire movie or show. Right now, HDR10+ is relegated to a about 100 titles on Amazon Video, but with enough industry support it could become more prevalent on sources like 4K UHD Blu-ray discs. You can learn lots more about HDR in our explainer. Let me be clear from the get-go: The Samsung Q9FN produces a deeply engrossing, enchanting, and engaging viewing experience. Over and over the word dazzling appears in my notes. Indeed, I was dazzled … constantly. This isn’t a perfect TV – but the overwhelming majority of people who see this TV will be sucked in, then blown away by its picture quality. Let’s talk about brightness first, because this is an area in which the TV particularly shines (sorry). If the TV can reach 2,000 nits as Samsung has suggested, it is only in specular highlights and with out-of-the-box TV settings. After our adjustments, we found the Q9FN could reach just over 600 nits with a full-screen window, and closer to 1500 nits with a 5 percent window. This is to be expected, since it requires a lot of power to drive all the LEDs in the TV to maximum brightness, whereas diverting all power to just just a few LEDs yields more intense luminance. 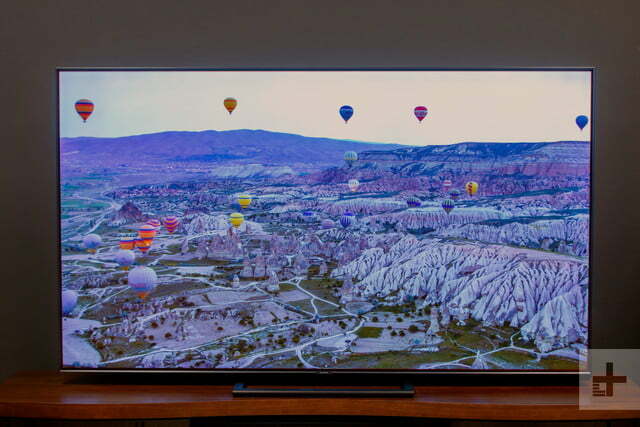 Here’s another way to put it: This is, broadly speaking, the brightest TV I’ve ever tested. With great power comes great responsibility, though, and there was visible evidence of the Q9FN going overboard in HDR mode at times. In instances where people’s faces were near bright objects, we witnessed their skin tones washing out. It appears that the Q9FN sometimes opts to brighten up the entire picture to favor high brightness in general. In some scenes, this is easily noticeable in side-by-side comparisons with other TVs. Fortunately, most folks don’t watch TV this way, and we know that brighter pictures tend to be favored by most viewers, so if dazzling beats faithfulness to a creator’s intent, then the Q9FN will suit you just fine. The intense brightness can also cause a strobing effect, amplifying the judder of watching 24p movie content. We see this when watching the best OLED TVs, too, so it is not an issue relegated to this TV. Some better motion control functions could help this, but as of now we’ve not been able to find an Auto Motion Plus setting that was able to defeat the strobing effect without introducing Soap Opera Effect. 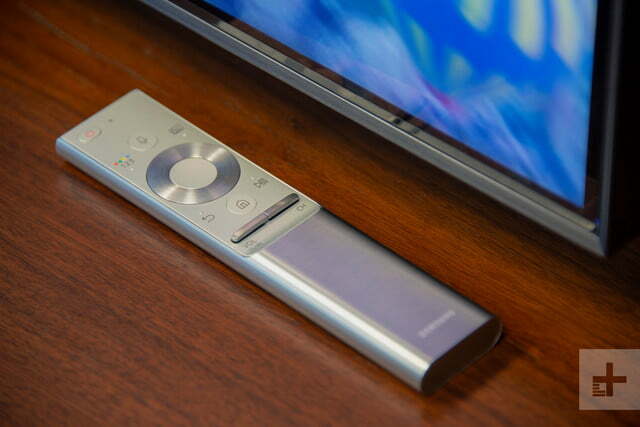 The Samsung Q9FN produces a deeply engrossing, enchanting, and engaging viewing experience. 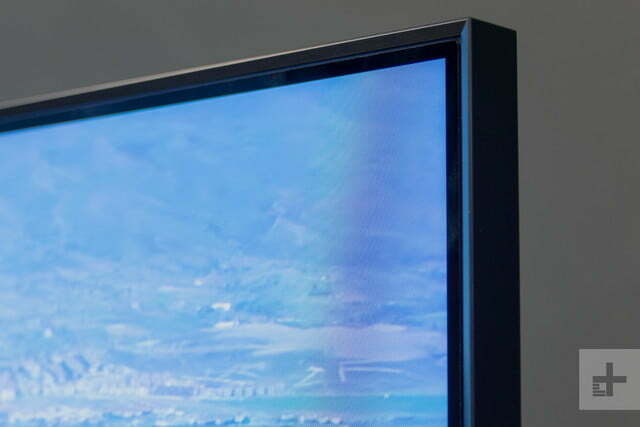 As for blacks, the Q9FN offers the deepest black levels I’ve seen on an LED/LCD TV. To get the best black levels, you’ll need to turn the local dimming setting to its maximum, but this comes with some minor disadvantages – sometimes you’ll see the backlight blooming in areas it shouldn’t. Set to medium, though, the TV seems to find a sweet spot between excellent backlight control, deep blacks, and brilliant highlights. It’s worth pointing out that the Q9FN does suffer from a little bit of “dirty screen effect,” which is to say that uniformity is not perfect – it rarely is with LED/LCD TVs. The only TV we’ve seen do better so far is the Sony X900F. Right out of the box, color in Movie mode was excellent with our review sample. Samsung rigorously vets and approves TVs before they go out for review, though, so out-of-box color on the model you get in a store may vary. That said, we know a professional calibrator can get this TV to an excellent standard of performance for both SDR and HDR content, and the color production is, again, dazzling. Motion performance, for us, was a mixed bag. With the correct local dimming settings, we enjoyed movie content a great deal, with judder levels exactly what we’ve come to expect. Fast motion when watching sports was decent, but we weren’t blown away until engaging the TV’s LED Clear Motion setting. It did darken the picture a bit but provided significant reduction in motion blur. This may be the best TV yet for gamers, at least in terms of input lag. Subjectively, we found the Q9FN to be extremely responsive, and objectively, other reviewers are clocking the TV in at 21ms or less in SDR mode and 22ms or so in HDR mode. In addition to low input lag, the TV’s ability to provide smooth motion while also delivering HDR made for a deeply immersive gaming experience. We’ve played Asassin’s Creed: Origins on four flagship 2018 TVs, and we have to say the Q9FN is our favorite so far. In terms of picture quality, the Samsung Q9FN stands right up to the Sony Z9D and gives it a good smacking around. This isn’t a TKO situation, but the two grapple with each other mightily for the title of best-ever LED/LCD TV. Each has its advantages and shortcomings, but if we had to pick one over the other, we’d pick the Samsung. Why? Because TV is about so much more than just picture quality. The Q9FN is a joy to use from the moment it comes out of its box, and we just can’t say that about the Z9D – honestly Android TV is the death blow for any TV we review. The Q9FN cannot beat OLED in terms of black levels or even color, but it does put out a seriously brilliant, bright image, and there’s no better TV for daytime or other bright-room viewing. And though most OLED users don’t seem to suffer from burn-in, it’s not something even need to worry about with an LCD like this. You could consider the Sony X900F as an alternative. It has better uniformity, and it costs a lot less. 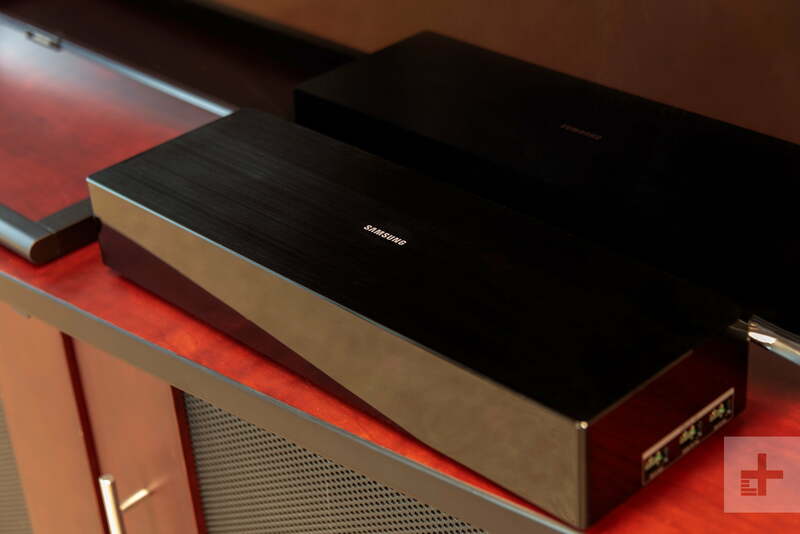 But the X900F doesn’t punch you in the eyeballs in the very pleasant way the Q9FN can, and the Samsung’s smart TV system is light years ahead of Sony’s Android TV system. The Q9FN will last as long as a TV can last these days, which is to say it can be updated over the internet until the tech inside is outpaced by new technology that is bound to come along in a few years. To be sure, this TV is going to look amazing for at least a decade, which is about as long as a TV lives in a home anymore. Yes, especially if you value a bright, brilliant picture over the very best dark room performance. The Q9FN is the most well-rounded TV I’ve ever reviewed, and I’m sure you’ll be as smitten with it as I am.